The district attorney’s office alleges that Lilly, 39, damaged his approximately $200,000 RV but did not file a claim until after he purchased insurance for the vehicle. The crime occurred in March 2014, Assistant District Attorney Lee Cunningham said. On Thursday, Lilly appeared in San Luis Obispo Superior Court and pleaded not guilty to three felony counts. He is charged with filing a false insurance claim, making a false statement in support of a claim and failing to disclose a material fact in connection with a claim. Lilly resides in Edna Valley. He retired from Major League Baseball in 2013 after a 15-year career that earned him nearly $100 million in base salary. 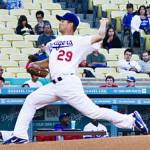 He spent four years with the Los Angeles Dodgers and was selected for two All-Star games. Lilly faces a maximum sentence of five years for the alleged crimes. He is due to appear back in court on Feb. 5. That was an amateur play. Insurance fraud needs professionalism to be successful just as much as baseball. He should have taken lessons from Murphy and Parkinson on how to screw an insurance company and get away with it. Another case of a OnePercenter® thinking they could do no wrong, they would not get caught, that they are “entitled” to anything their heart desires. More like this, please, DA Dow. What? He didn’t already make a ridiculous amount of money to play a game with a little while ball? He must have paid cash for it, a finance Co would have mandated full coverage before he took possession. You choose to defraud an insurance company ($200k) and you’ll do some time. Defraud individual investors of (100 Million) and you get a slap on the wrist with the promise to never do it again, that is if you ever get to trial! Unfortunately, you’re correct. It’s all about how much justice you can afford. With all of it’s failings though, the US Justice is still tops in the world. How unfair! You actually have to buy insurance before a loss?? LMAO! Jon, are you making a joke about Obamacare? Cut that out!